11) 1/4″ Drive 6 Point Sockets: SAE 5/32″, 3/16″, 7/32″, 1/4″, 9/32″, 5/16″, 11/32″, 3/8″, 7/16″, 1/2“, 9/16. 12) 1/4″ Drive 6 Point Sockets MM – 4mm, 4.5mm, 5mm, 5.5mm, 6mm, 7mm, 8mm, 9mm, 10mm, 11mm, 12mm, 13mm. 11) 3/8″ Drive 12 Point Sockets SAE 1/4″, 5/16″, 3/8″, 7/16″, 1/2″, 9/16″, 5/8″, 11/16″, 3/4“, 13/16”, 7/8”. 14) 3/8″ Drive 12 Point Sockets: MM – 6mm, 7mm, 8mm, 9mm, 10mm, 12mm, 13mm, 14mm, 15mm, 16mm, 17mm, 18mm, 19mm, 20mm. 7) 3/8″ Drive 6 Point Sockets SAE 3/8″, 7/16″, 1/2″, 9/16″, 5/8″, 11/16″, 3/4”. 5) 3/8″ Drive 6 Point Sockets MM 12mm, 13mm, 14mm, 16mm, 17mm. 5) 1/2″ Drive 12 Point Sockets SAE 1/2″, 9/16″, 5/8″, 3/4”, 7/8”. 5) 1/2″ Drive 12 Point Sockets MM 15mm, 17mm, 18mm, 19mm, 21mm. 6) Combination Wrenches SAE 5/16″, 3/8″, 7/16″, 1/2”, 9/16”, 5/8”. 6) Combination Wrenches MM 8mm, 10mm, 12mm, 13mm, 14mm, 15mm. 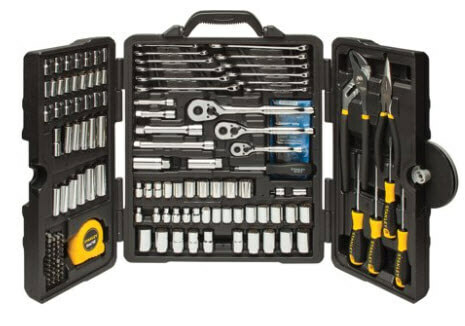 11) Mechanics Tools & Accessories: 1/4“ Drive Pear Head Ratchet, 1/4″ Drive 3″ Extension Bar, 3/8″ Drive Pear Head Ratchet, 3/8″ Drive 3″ Extension Bar, 3/8″ Drive 6″ Extension Bar, 3/8” Drive 6 Point 5/8” & 13/16” Spark Plug Sockets, 3/8” Drive Female to 1/4” Drive Male Adapter, 1/2” Drive Pear Head Ratchet, 1/2” Drive 5” Extension Bar.